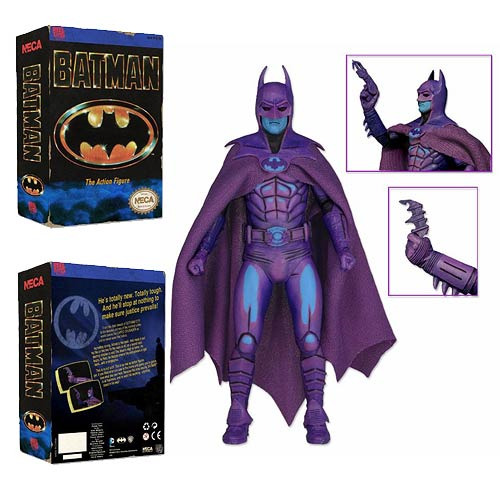 This fantastic Batman 1989 Video Game Batman 7-Inch Action Figure is the 6th in NECA's highly successful line of classic 8-bit video game tributes! Following Michael Keaton's iconic portrayal as the Dark Knight in Tim Burton's Batman, the side-scrolling game was released in late 1989 for the super popular 8-bit home console, and is a true 1980s classic! Batman stands 7-inches tall, with over 25 points of articulation for great poses, plus removable cape, Batarang and Spear Gun accessories. The paint deco takes a stylized approach to reproduce the game's original cel-shaded look! This limited edition figure comes in special window box packaging with opening flap to re-create the look and feel of the classic 1989 video game packaging! Ages 14 and up.